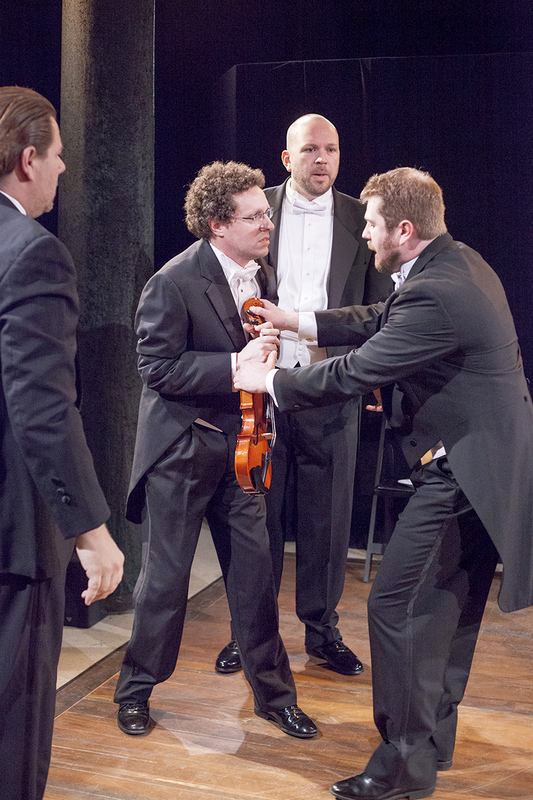 A very astute and smart extended one-act by Michael Hollinger has its local premiere at West End Players Guild and they make the most of this humorous, tense and realistic look behind a world-renowned string quartet. “Opus” takes us on an unexpected journey through egos and professional jealousy that makes or breaks the artistic temperament and credibility of the group as a whole. 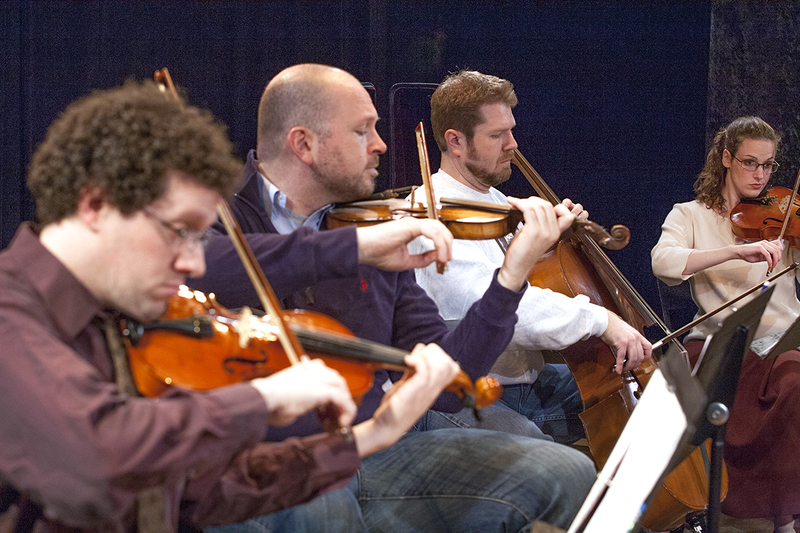 Director Jerry McAdams transforms the usual WEPG space into an intimate three-quarter space that allows us to feel how cramped and tightly knit rehearsals for the quartet can be. With able assistance from designer and tech director, Ken Clark, it works beautifully. Stephen Peirick leads the way and commands the stage even when he isn’t present. As perhaps the biggest ego but the most demanding and meticulous of the quartet, he really keeps them on the path to a quality sound. But this strive for perfection keeps the others “unstrung,” as it were. You hear comments about “it’s good enough,” or “let’s keep that take.” But Peirick’s Dorian knows they won’t reach and keep their high standards without the effort. John Wolbers is delightfully sarcastic as Elliot. His lust for Dorian’s instrument is clear and their unstable relationship becomes clear as well as the play progresses. Dennis L. Folwarczny II as Carl seems to be the most steadying influence in the group but even he can have some classic moments- most importantly his reticence in revealing a recent health prognosis. Alan, played by Jonathan Hey, is the least uptight of the quartet and even tries to have a dalliance with the newest member of the group when Dorian is dismissed. That “fifth” member is Grace, played with demure innocence by Caitlin Mickey. She is the most accomplished of the quartet who does have strong opinions but shies away from expressing them most of the time. When members of the group- Elliot in particular- frown on any romantic inclinations in the quartet- they begin to turn on him, knowing of his past relationship with Dorian. An invitation to the White House for a performance highlights the pinnacle of success for the quartet but it also begins to undermine the stability of the group. A series of plot twists bring “Opus” to a dramatic conclusion in what is a very satisfying evening of theatre. 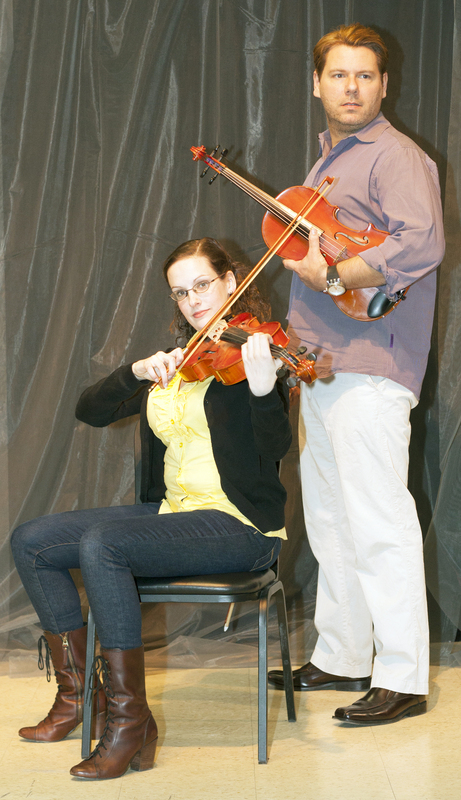 The precise off stage music, the result of Mr. McAdams creation and the execution by Mary Beth Winslow, makes the quartet’s playing of instruments highly believable. The Tony Anselmo lighting design and the costumes of Renee Sevier-Monsey also add well to the mix. The night I attended, A Fifth Above Woodwind Quintet performed on the set before the performance and were simply outstanding. It really got the audience in the mood for the play. With powerful and close-knit performances and strong direction, “Opus” is well worth seeing at West End Players Guild. It’s good enough to see twice and the Repertory Theatre of St. Louis will offer that opportunity next season on their Mainstage. But you can’t go wrong with this excellent performance at WEPG. It only plays through April 14th, so contact West End Players Guild at westendplayers.org for tickets or more information. This entry was posted on April 8, 2013 at 9:43 am04 and is filed under Uncategorized. You can follow any responses to this entry through the RSS 2.0 feed. You can leave a response, or trackback from your own site.